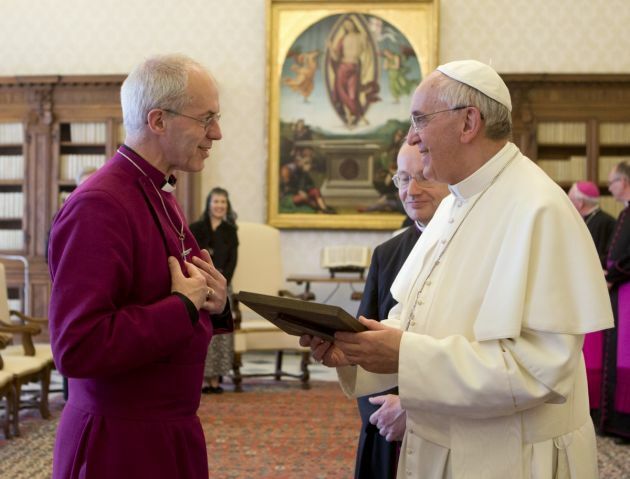 Pope Francis and the Archbishop of Canterbury in Christmas messages have spoken of suffering caused by Islamist extremists, with Justin Welby warning they threaten Christians with "elimination" in the very birthplace of their religion. "We pray to the Lord that the agreement reached in the United Nations may succeed in halting as quickly as possible the clash of arms in Syria and in remedying the extremely grave humanitarian situation of its suffering people. The Pope urged the world in Dec. 25 address to unite to end atrocities by extremists who commit atrocities in the name of Islam, saying they have caused immense suffering in many countries. "My thoughts also turn to those affected by brutal acts of terrorism, particularly the recent massacres which took place in Egyptian airspace, in Beirut, Paris, Bamako and Tunis," said Francis. Security was tight at the Vatican as Francis, marking the third Christmas since his election in 2013, to read his traditional Christmas Day "Urbi et Orbi" (to the city and the world) address, Reuters news agency reported. Police armed with machine guns discreetly patrolled the area in unmarked vans with dark windows. At Canterbury Cathedral, Welby used his Christmas Day sermon to brand the Islamic extremists "a Herod of today" - a reference to the biblical despotic king of Judea at the time of Jesus's birth. In the service at Canterbury Cathedral he said that the group calling itself IS that wants to set up an Islamic caliphate is "igniting a trail of fear, violence, hatred and determined oppression." He told the congregation: "Confident that these are the last days, using force and indescribable cruelty, they [IS] seem to welcome all opposition, certain that the warfare unleashed confirms that these are indeed the end times. "This apocalypse is defined by themselves and heralded only by the angel of death," said Welby who is the spiritual head of the 85 million strong Anglican Communion, the UK's Press Association reported. He added, "To all who have been or are being dehumanized by the tyranny and cruelty of a Herod or an Isis, a Herod of today, God's judgment comes as good news, because it promises justice." In his address Pope Francis condemned recent "brutal acts of terrorism," including the Nov. 13 attacks by Islamist militants that killed 130 people in Paris, and the downing of a Russian plane over Egypt's Sinai peninsula that killed 224 people on Oct. 31. Both were claimed by the group that calls itself Islamic State. He called for peace between Israelis and Palestinians in the area where Jesus was born. "Where peace is born, there is no longer room for hatred and for war. Yet precisely where the incarnate Son of God came into the world, tensions and violence persist, and peace remains a gift to be implored and built," said the pontiff. He asked God to bring consolation and strength to Christians who are being persecuted around the world and called for peace in the Democratic Republic of Congo, Burundi, South Sudan and Ukraine.